Published by Cyril Huze April 17th, 2016	in Controls, Customs and Editorial. I like very much these “Milano” grips marrying resin inserts with billet aluminum. 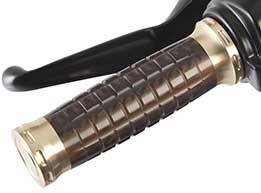 The resin insert is made out of billet resin with each grip set offering a unique color tone that can’t be duplicated. Ergonomic shape and comfortable to the touch. 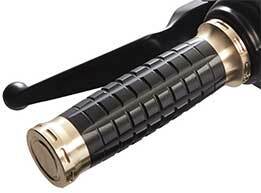 For the aluminum part of the grip you can choose between chrome, brass and smooth or wrinkled black anodizing. Made in Italy by Ottodicuori Italy. Something new and very good looking. Now if I only knew how to speak Italian…….The web site is 100% beyond me! The very old is reborn!